One of the major causes of death across the world has been pinpointed to be accidents during transit. Among the accidents that claim lives, large portions occur to motorcyclists. This is for obvious reasons. Compare the size and fortification of cars and larger vehicles with that of a motorcycle. A motorcyclist has the ability to weave through traffic and cut gaps to travel faster. At the same time, the lack of a surrounding metal body leaves the motorcyclist vulnerable to any external stimuli. Thus, in an accident between a motorcycle and another type of vehicle, it is usually the motorcyclist that bears the brunt of it. Here are 3 tips to avoid motorcycle accidents. One of the biggest mistakes made by motorcyclists is driving when they feel drowsy. This might be the early hours of the morning when you have to make it to office or late in the evenings back from work. It is proven that the brain works at a sub-optimal level when you are sleepy and your lack of immediate response puts you at the risk of motorcycle accidents. The same effects work on your brain under the influence of alcohol. Driving in such a state not only violates the law, but also puts you at threat of colliding with others. While you might argue that motorcycle accidents are quite common during the day, it is no secret that the night is much more prone to causing accidents. This is due to the blockades in vision that come into force as well as the speeds at which vehicles travel. Owing to sparse traffic and civilians, many large vehicles barge through roadways without caution or care. Such conditions are dangerous for a motorcyclist to be riding around by himself. If absolutely necessary, stick to one side of the road and keep your high beam on at all times. 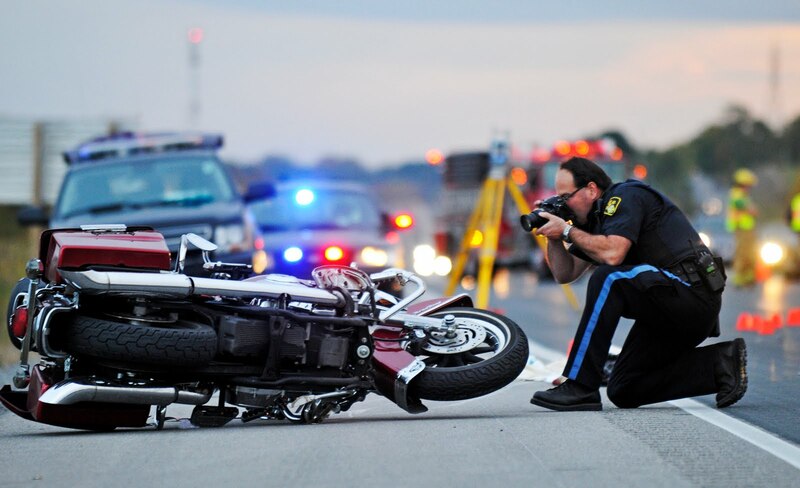 Weather and road conditions are large causative elements in the occurrence of motorcycle accidents. Surprisingly, both excess heat and cold can cause you to land in an accident. High temperatures cause your tube to expand and burst tires resulting in accidents. At the same time, snowfall and hail makes the road slippery and causes the rider to lose control over the vehicle, resulting in a motorcycle accident.